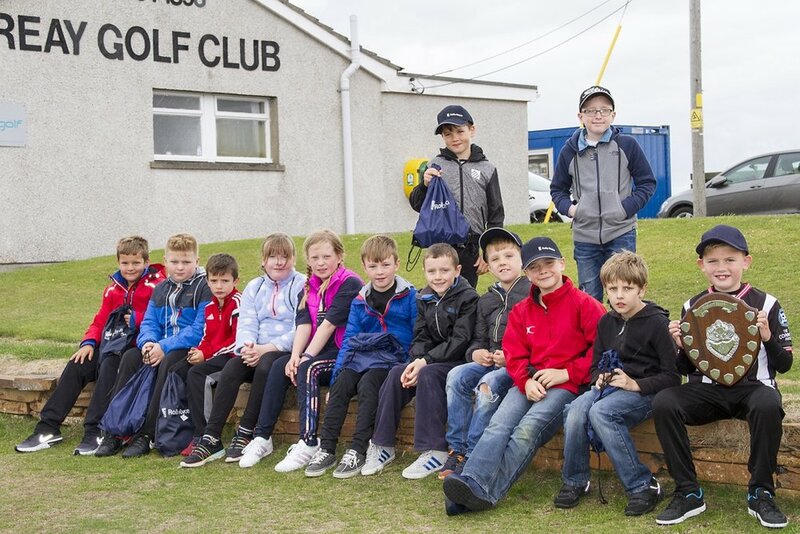 Nearly 50 juniors turned out to contest the Reay Golf Club Junior Open held in August with a number of representatives from Brora Golf Club and a fantastic turnout from the local golf clubs. A breezy cool day made scoring far from easy. In the 18 holes off medal tees, Grant Ross from Brora won the gross prize for the second year in succession with a credible score of 86. In the nett section Cameron Mackay (Brora) won by a single stroke from Kyle MacLeod (Reay). Cameron takes home the Northern Heating Supplies Trophy for best nett with a 74. In the18 hole competition played off the junior tees Tyler Gordon Thurso won the gross prize with a superb score, Ben Durrand (Thurso) won first nett with an amazing score of 68 with second place going to Reece McKellor. In the girls competition Laura Bain (Reay) won the Gross Competition with Emma Durrand (Thurso) winning the net trophy. The ‘Fairway Ferrets’ section for the youngest players was played over both the junior three hole course and the main course. Scoring on the junior course was very close with a play off being required to separate the scores of Ryan Wyllie (Thurso) and Jamie McAdie (Reay) with Ryan taking home the trophy, in third place was Victoria Fryett (Reay) with Eva Lambie (Reay) fourth and |Callum Innes taking fifth place. On the main course Ross Rosie (Reay) scored an excellent 20 just one point ahead of Cameron Mackay (Reay), third was Scott Malcolm (Reay), fourth was Charles Fryett (Reay) with Luke Taylor (Reay) fifth. Ross won the Dunnett Shield. The one hole was won by Brodie Bain (Thurso) who also won the putting competition for his age category. Reay’s Head Coach Evan Sutherland thanked all the sponsors - O’Brien Construction, W & D Ross, Mrs Janette Wallace, Mr Alistair Giles, Mrs Anne Morris, Bank of Scotland and Inverness Golf Centre for their support. As a result of this kind sponsorship every player received a prize. The prizes were presented by Anne Morris, one of our very generous sponsors.